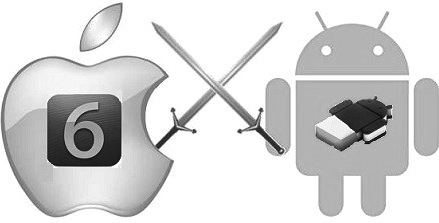 The battle between Apple and Android never seems to end. With the unveiling of the much-coveted Ice Cream Sandwich, everyone thought that Apple’s glory days are slowly waning. However, Apple, the dark horse that it is, has managed to wow the crowds again by coming up with a bucket load of goodies for its insatiable fan base. During the 2012 WWDC, Apple offered the crowds a glimpse of its upcoming mobile operating system, that is iOS 6. Packed with more than 200 new features and enhancements, the latest iteration of iOS is expected to hit the shelves this fall. Ice Cream Sandwich on the other hand is trying to make its presence felt on every phone. With the launch of Samsung Galaxy S3, a potential iPhone-killer, Google has shown the world that Apple is not the only one that can make heads turn. And, with the announcement of iOS 6, the Apple-Google rivalry has started to resemble a furious ping-pong battle. Whatever be the case, there’s no question that people are going to compare iOS 6 to Ice Cream Sandwich. And we too, like many technophiles, couldn't resist pitting the two biggies against each other, just to see which one wins. When it comes to features, there’s no clear winner here. There are some functionalities that one offers and the other doesn't, thus leveling the playing field. That said, with iOS 6, it’s very evident that Apple is trying to provide everything that made Android popular. The whole new Maps application on iOS 6 plans to give Google Maps a run for its money. It has Yelp integration for reviews along with 100 million + business listings. Moreover, the traffic service shows you the fastest way to reach home. The killer feature, however, is the Siri integration. Just tell Siri where you want to go and it will take you there making the phone more personal as compared to Android. That said, it’s not as if Google Maps will be totally outmatched by this newcomer. Google Maps is an established product that is used by millions already. Its tight integration with other Google services and also its widespread popularity make it a product that is hard to let go. If anything, Apple Maps to Google Maps will be what Facebook was to Google Plus. As great the latter maybe, if millions are using it already, not much is bound to change. Well, finally Facebook integration is here for iOS. It will allow users to share photos, links, and more via Facebook. As shiny as the feature as might seem to many Apple fanboys, Android users will smile at this offering with disdain. Ice Cream Sandwich, and all the previous Android operating systems offered tight integration with social services. So, simply for the lack of novelty, Apple loses out in this department. Apple’s updated phone app will let you slide up on an incoming call and reply the caller with message telling why you can’t pick up the call. Again, this is a feature that Android was having for a long time, making ICS the winner. When Do Not Disturb feature is enabled, your iPhone will receive calls, messages, and notifications; however, your screen won’t light up thus letting you sleep or work in peace. You can also set DND to start up automatically at a certain time of the day. With Android offering nothing to compare with this addition, there is very little doubt that Apple users will adore this feature. As always, it shows how deeply Apple cares about the needs of its users. Siri, Apple’s killer feature will be taken up a notch in iOS 6. With more knowledge about sports, restaurants, Siri is bound to make every Androider lust with envy. And though, Android has a huge list of Siri-like apps, they are not as good as the original. Safari will now feature an offline reading mode, along with cloud syncing of open tabs. However, ICS already offers this feature in its default browser and then there’s Chrome, which fills the gap by bringing cloud syncing. So, in short, the winner is our beloved Android. Though iOS 6 is exciting enough to make any Apple lover jump with joy, I think it’s just not great enough to make an Androider quit his Ice Cream Sandwichy phone. Try harder Cupertino, try harder.